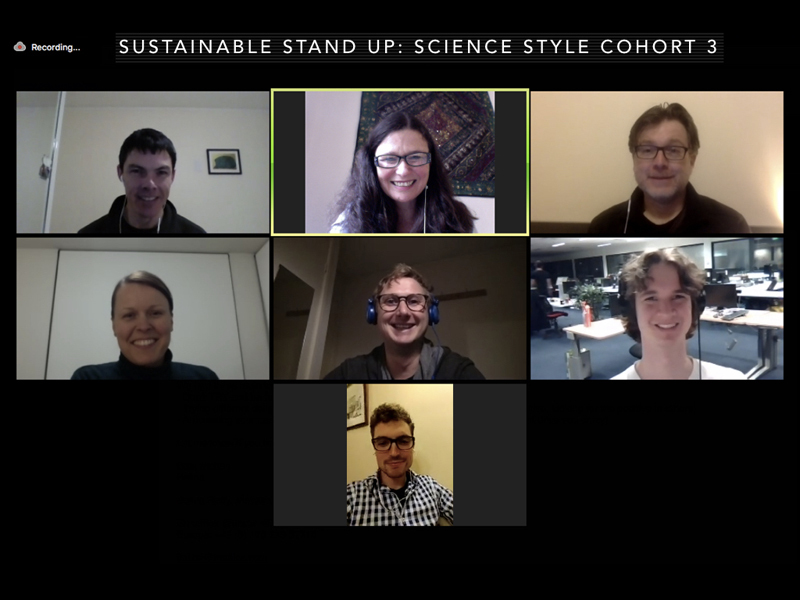 National Science Week wanted environmentalists who had never done stand-up comedy to perform a 5 minute comedy set based on their personal convictions. The idea is that comedy is an alternative avenue for people to express the reasons why they care about social issues. Using humour, rather than seriousness, provides a different way for the performer and audience to engage with a topic. There were two Australian cohorts: one in Melbourne, and one in Canberra. Each cohort had ten members. As much as possible, we were encouraged to write jokes, and to develop a narrative thread that was specific to us as an individual. We were encouraged to reveal who we are to the audience, so that they could appreciate the rest of our set with that as their context. We wrote alone, and then shared our material with the classmates during our video conferences. After hearing their embryonic jokes, we gave feedback to our fellow comedy students, and received feedback on our jokes. Week by week, we each honed towards the 5 minute set that we would perform before a live audience during National Science Week. Comedy is simply a very specific way of telling a story. It is like traditional storytelling, but with all of the non-essential, non-funny parts of the story removed. Focus on connecting with the audience, by finding a point of common ground to bring them to agree with your argument. Useful for our environmentalism-focused comedy sets. Write your jokes with playfulness and joy. Get over your fear of diminishing the seriousness of your topic by joking about it. Resist the temptation to begin your set with a few jokes, and then conclude with a serious lecture. Keep this as a comedy performance. Listen to others’ feedback to understand how you are seen by others. Use this to develop your ‘persona’, or ‘identity’, or ‘voice’ when writing and performing. Ask yourself: “What is this beautiful thing that I care about, at the heart of my concerns?” i.e. go beyond ‘angry’ to point to the things that you actually care about. When you are speaking in public, be the high-status version of yourself. Think about how one person can display either ‘high status’ or ‘low status’ through their body language: posture, voice, and attitude. We want to display the ‘high-status’ version of ourselves. We want to ‘own the space’ when standing on stage, showing confidence and comfort. Importantly, we don’t want to be a ‘high status’ person who uses their persona to bully or demean others. Instead, we want to use our body language in an inclusively confident way that puts our audience at ease, and inspires joy. This is a big tip that I will continue to use into the future, when speaking in public. Before stepping on stage, I will enter the performance role of “high-status Stuart”. It was very exciting to be part of a cohort of comedy newbs, who were all writing and performing for the first time. It was really interesting to see the evolution of my classmates’ comedy sets on a week-to-week basis. For me, it was always a mix of wondering “why didn’t they include my favourite joke from last week’s set?”, through to laughing at the debut of a great new joke. Everyone had their own personal style, and we each found our ‘voice’ as the weeks went by. In our classes, we got to see ideas go from long and rambling jokeless stories, to a sequence of well-drafted jokes, punctuated by the audience’s laughter. It was fascinating to see how others used their 5 minutes in the spotlight. Some of my classmates told me that they had always been the “quiet person in the background”, and it was a great personal experience to realise that they could inhabit the stage and be funny. It was incisive hearing feedback from our peers about our material. With a spirit of “positive, constructive feedback”, we mostly focused on complimenting the aspects of our classmates’ sets that we thought were strongest. We offered encouragement for people to go deeper into funny ideas that had only momentarily surfaced in sets. It was interesting to see which jokes the audience did and didn’t laugh at. e.g. I thought my 04:09 line about me talking about Cory Bernardi and The Patriarchy was particularly clever, but the audience reaction was crickets chirping. By constrast, I thought my 01:11 line “all I do is sit around and care about things“ was a throwaway link between ideas. But this got a big laugh from the audience during rehearsal. My peers encouraged me to go deeper into that idea, with examples of what I care about, and how I care about them. Sustainable Stand Up provided a great personal challenge that added extra dimension to my life during July and August 2017. Knowing that we had to write jokes for our weekly homework assignments provided a great creative challenge. With the clock ticking until show night, it was amazing to see how jokes appeared out of nowhere to fill the void. I initially baulked at the A$375 registration fee, but later realised that this represented incredible value for money. When considering the hours of coaching, the camaraderie, the thrill of Show Night, and the YouTube video souvenir, it was money well spent. 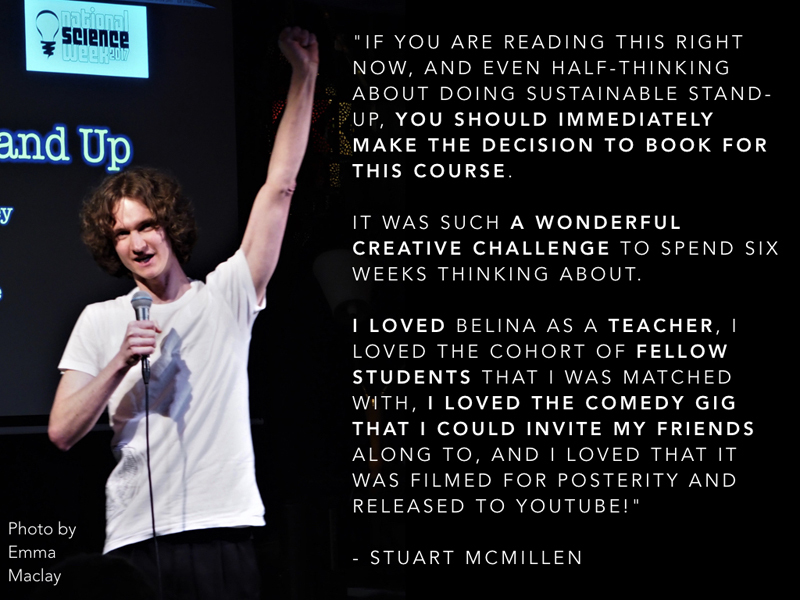 Check the Sustainable Stand Up website for upcoming courses near you. London and Berlin are served with regular classes, and Belina also travels to other cities and countries.